Dear readers, we are happy to inform you that we have changed our website design and content. You can find it here: http://dfge.de/en/. In this article we briefly explain the main changes and how we hope you will benefit from our relaunched website. 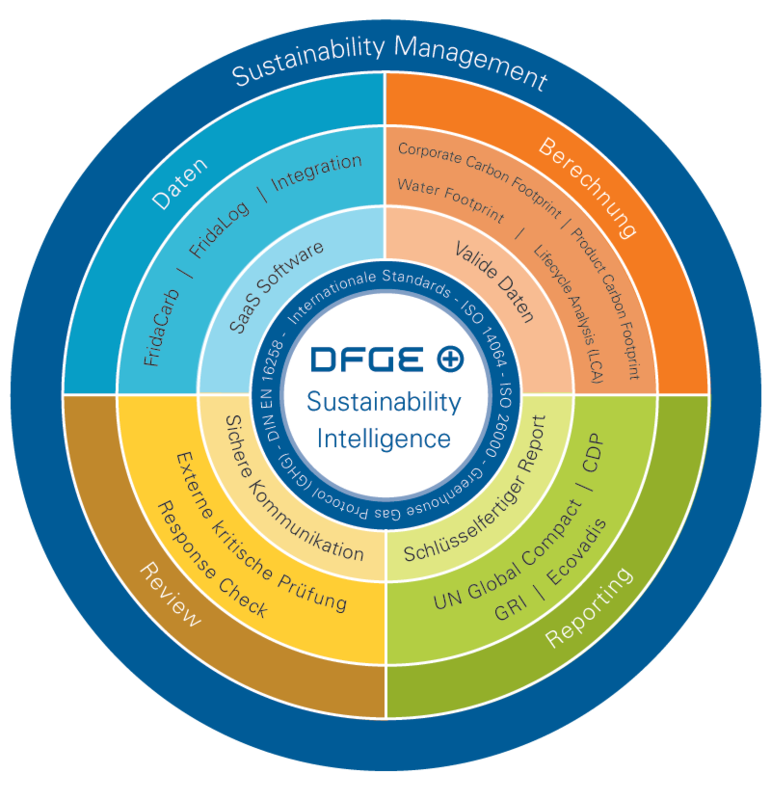 DFGE’s Sustainability Intelligence approach aims at leveraging the life of companies by reusing existing and available data to reusethem for other standards, and making the link through them. In this sense, our offer is built around Sustainability management: we transform existing data (calculation), we include them in sustainability reporting frameworks (reporting). We also help companies plan their strategy, implement their actions and review these actions with dedicated KPIs. All these processes are documented and can be reused in calculation and reporting – this is Sustainability Intelligence. Thus our website is structured around calculation, reporting and management. Since 1999, DFGE has been specializing in carbon footprint reporting and environmental management. Over the past few years, DFGE has noticed increasing participation in CSR standards such as United Nations Global Compact (UNGC), EcoVadis, GRI,… DFGE has extended its competencies to better support companies in their current challenges, from CO2 emissions to a broader CSR/sustainability strategy. In this sense, you can find new webpages on our EcoVadis and GRI support. We have just signed a partnership with EcoVadis and will provide response checks of questionnaires as a starter package. The complete package features a fill-in questionnaire and a prioritized CSR improvement strategy with dedicated feedback on current documents and practices. 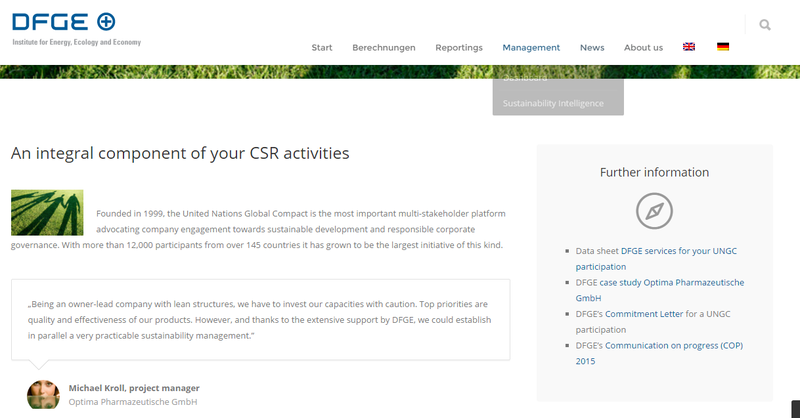 Our GRI support enables us to help companies identify their main impacts and topics of interest, and to prepare the contents of CSR report following the GRI G4 Guidelines. To ensure a nice visitor experience, we made sure to structure the pages in different blocks and to reduce the amounts of texts and. For instance, the background information about a dedicated standard can be found at the bottom of the page, if you decide to expand the text blocks. There will be a special announcement for the final move – we hope you will like the new blog style. We would be happy to receive your feedback at info@dfge.de. Happy reading!